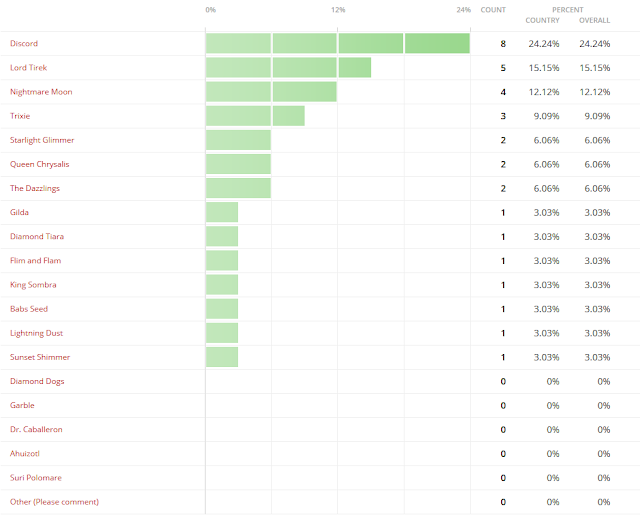 Here's another round of voting! See? Discord is best antagonist! He is really awesome back when he was a villain, and he remains awesome up to this day. Tirek is one badass villain, as we've seen in Twilight's Kingdom. Looks like many major villains get their spots as well, but some villains need more love. Poll Results: Favorite physics theory? Yes, the Big Bang theory is really the best physics theory. It's just amazing how our universe started with rapid expansion. Einstein's theory of relativity comes close, and it really does explain lots of stuff. I knew it, I should've added more options, but I just included what Michael T. S. suggested. Also, unfortunately, quantum stuff at the subatomic level do not get much love. Aww. 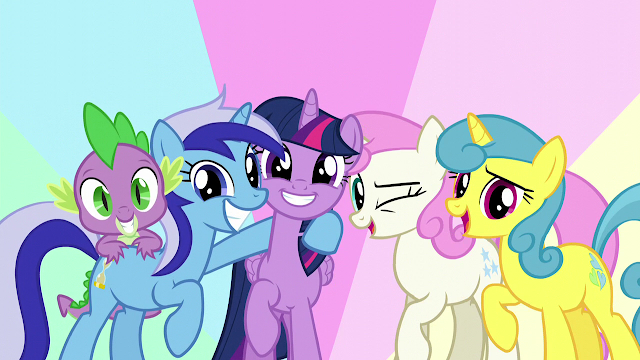 Anyway, d'aww, look at these friends! Now let's start talking! - Favorite physics theory? 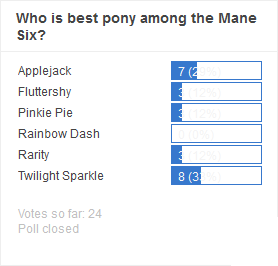 Suggested by Michael T. S.
Poll Results: Who is best pony among the Mane Six? I KNEW IT! THE ADORKABLE PRINCESS WINS! By one vote. But still, she really is the best! Fair enough, Applejack got second. Good thing she gets more love here. Apparently, Starlight Glimmer cast a spell on Fluttershy, Pinkie Pie, and Rarity. Nuu! Why these ponies! Suggest a poll on the comment section, or else, I'm gonna think of something.... complicated. Or not. P.S. I'm gonna be using Polldaddy from now on. My mind has finally settled on doing contemplations like these instead, so that I can effectively synthesize instead of letting all my knowledge (or the lack thereof) remain stagnant in my head. Check below the break for this contemplation! Which of the following is the best season opener or finale? Including the movies? EqD failed us, so let's have a discussion here! I hope... Anyway, d'aww, look at these friends! Now let's start talking! Sounds like some awesome shielding from our adorkable protagonist. Check below the break for more info regarding this post. Sugar Belle has Something for You!